Real or not, the M2 is beautiful in black. And then, there is another reason, based on market fundamentals, if you allow me. A black paint M4 is around 3000 USD, whereas a black (not enamel) M6 is around 1500. If the black paint market crashes, that means that a black paint M4 would sell at the same price as an M6? I don’t think that is quite likely.. 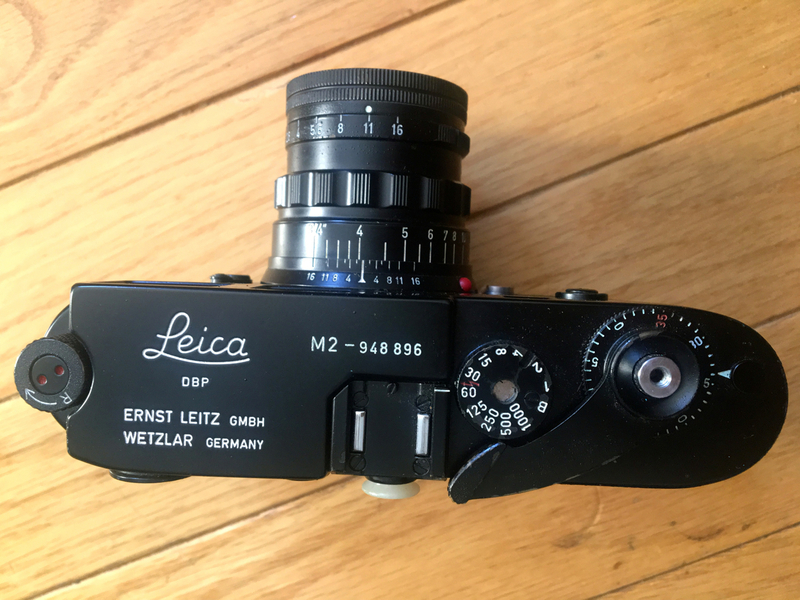 This is a real one, not restored by Leitz. Wonderful! 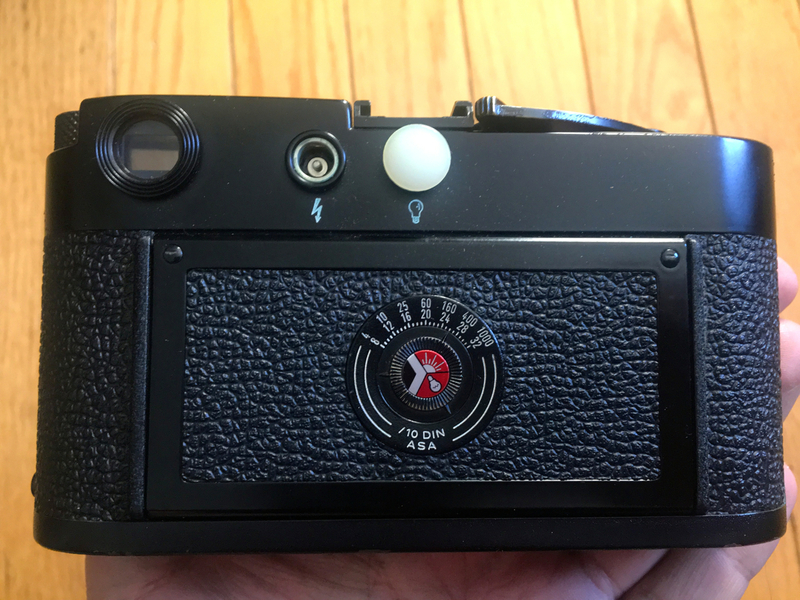 Given a choice, I always prefer a black camera. 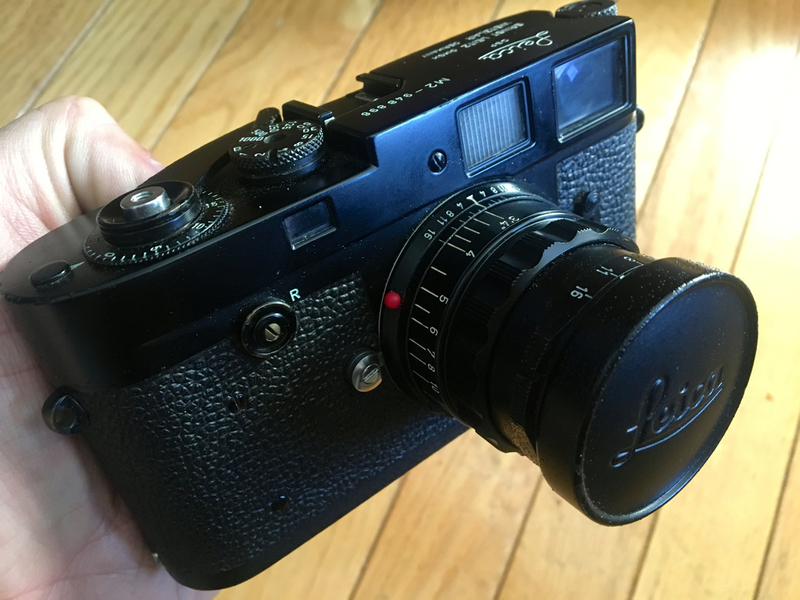 There are plenty of them- even Leicas- around that do not demand a premium. 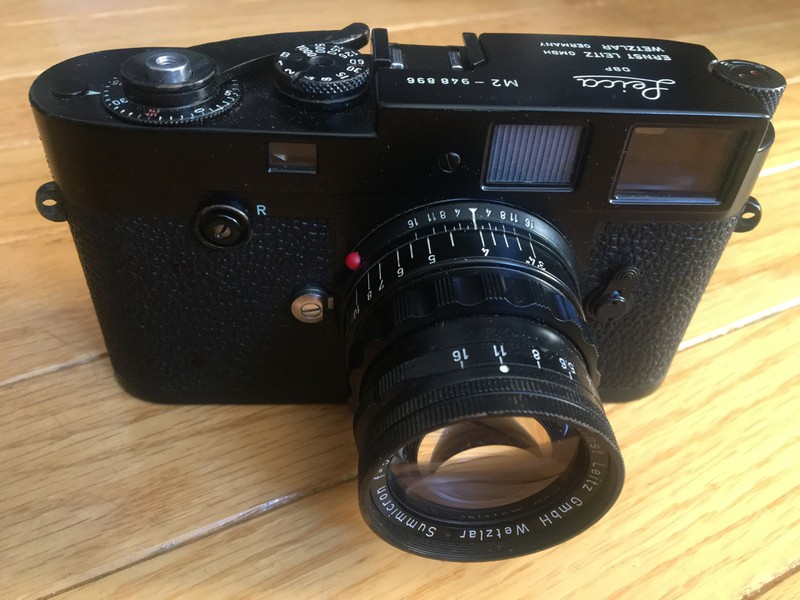 I suppose seeking rare, extraordinarily expensive black Leica cameras could reasonably considered a vice; a vice always seems to carry the possibility of unwanted consequence, e.g. laying out a load of money for a fake camera. You may be right about a crash. But then…..P.T. Barnum. Upon second view I see that the central part of the speed dial is black on other black cameras of this series. Whether the speed dial is black or chrome seems to be hit or miss on other authentic black paints. I wouldn’t read too much into it. Its obviously a repaint. Nice looking regardless.. I have no doubt this is a legit Black Paint. It’s a beauty too. The various responses to the post, however, seem to prove my point – there’s so many fakes out there that owners of the real ones, like you, are always fighting against a healthy skepticism brought about by all of the fakes having been foisted off on folks over the years. Also Erik I know you are an authority on these things but in researching the first few hundred black paint m2s (and nearby serials) I noticed the centers of the speed dial were also chrome like on mine. Watch and read this thread, Justin. You’ll see a picture of 948895. Black center of the speed dial. I have many pictures of this 948*** and 949*** series in my archive and they all have black centers. Erik As previously noted they must have made them both ways as I have definitely seen verified examples from the first batch of 500 with the chrome centers sell in auction. Furthermore as I said before the guy I bought it from was an old timer said his dad owned a camera store for like ten years and that’s how he got into “high end” cameras as he said and he bought this one in 58 used it for a year and moved on to a Nikon slr. If you were there you would know this man had no reason to make up stories about the camera. He shared many interesting stories with me about the time period, his interest in photography etc. he was just an old timer looking to get rid of some stuff. As I said this is piece of mind enough for me. if people want to question it they can but I have had equally as many people say it is 100% without a doubt one if the first 500 (#295 to be exact)and definitely not a repaint just a “closet classic” as one person said. 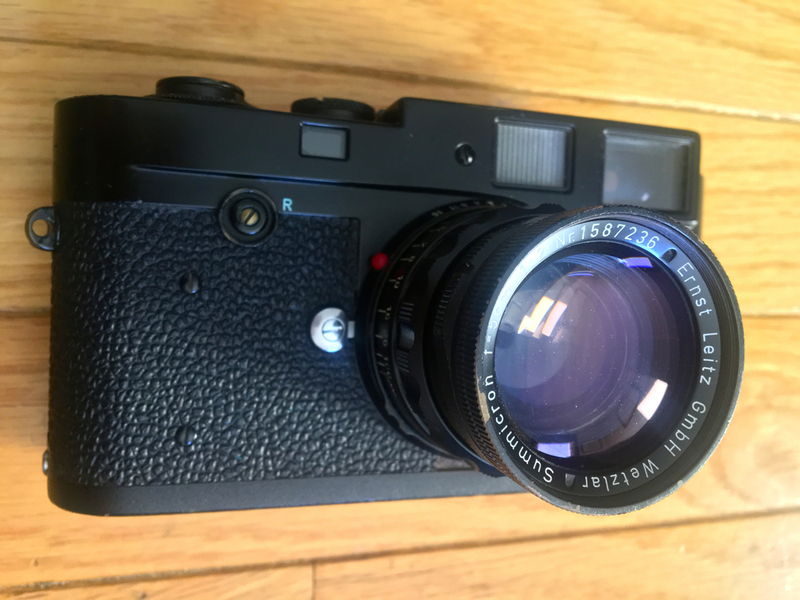 A quick search turned up an early original 948-99X lever rewind M2 on the rangefinder forum with chrome center. If they were doing it that close in serials I’m sure it could have just been a difference in who painted it/where it was painted etc. Very interesting information Justin, thank you. I was wondering if there is a way to check whether my – almost pristine condition – black paint M4 was actually repainted before reaching my hands. According to the serial number it is a legit black paint item, but for its age it looks almost untouched.